Thank you for supporting Youth Music Education Programs by attending the cruise or donating above! After making your choice and clicking the 'Add to Cart' button, you will be prompted for quantities on the secure order page. You don't need a PayPal account to use your credit card or bank account. Just click on the "Checkout" button, then "Don't Have a PayPal account?" You will be presented a screen where you can use your credit or debit card. There is limited space so don't waste any time reserving your tickets! Support Youth Music Education Programs and enjoy a night to remember! Click here for more details or see bottom of page. Join us for our 45-minute narrated boat tour through the sparkling waterways of Huntington Harbour. See thousands of lights on boats, decks, docks and homes, plus incredible animation. 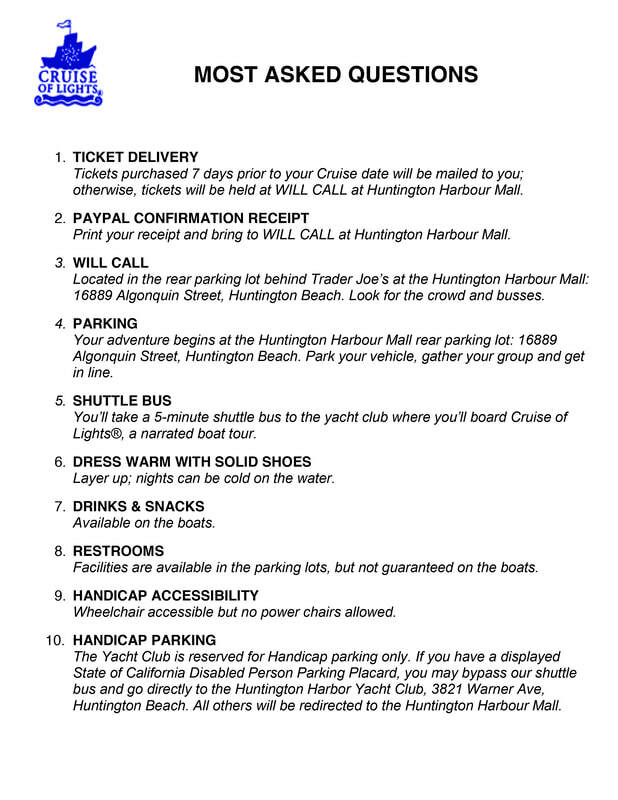 Enjoy even more holiday lights on our 70-minute cruise down additional waterways in Huntington Harbour. Experience the Harbour like never before with the intimacy of the narrow channels.